We were just about to paint the green living room white when the phone rang. Dolores and her husband Tom, our next door neighbors, were arguing again. We had heard them earlier but I was intent on keeping us both working the paint across the walls so I kept my mouth shut. I don't know what kept you silent. But now it was Dolores on the phone asking for you, asking for your help. "Please come over and be our good will ambassador." Everyone knew your rule: if someone has the intelligence to ask for help, anyone intelligent enough to hear it is obligated to respond. You smiled at me eavesdropping and observed me starting my slow rage. Into the receiver you said firmly, "I'll be right there." Laughing at my jealousy you held my body against the green wall and painted my outline really fast against it. My green jealous body traced in thick white. When we stood back to admire your handiwork, I grabbed you. Holding you tight (my left shoulder against your chest) I placed the paint brush between your legs, traced your thighs, your hips. You bolted forward and hit my hand: I got paint all over the right thigh of your tight blue jeans. You kissed me  hard  and left. I stared at the wall, a mess of our bodies shadows. Later that night Dolores in tears explained, brokenly, that Tom held the camera up to you and said he wanted a picture of her favorite ambassador. You were mugging for them, mugging for peace. When the shutter clicked, instead of the light dilating, a bullet shot out of the lens and shattered your skull. I was getting over you. I could tell. I finished things, started others. I hardly ever thought of Holbein. He himself had become a "hollow bone" in my memory. But recently, since the police in Los Angeles were found not guilty for beating Rodney King, I started thinking about Martin Luther King and Martin Luther and the painting. I started dreaming of you and of my professor friend in London. I wanted to be an ambassador for the new State. 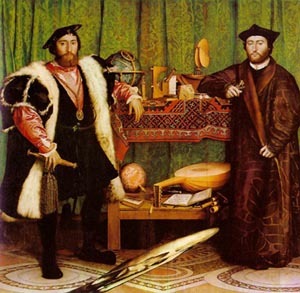 Illustration: Hans Holbein, The Ambassadors, 1533.